"The ultimate question in these tragedies is: Can we really trust computers as much as we trust ourselves? For some things, perhaps not. But if we want to travel faster and in more comfort, we have to let ever more computerization into our lives. And that means that we have to focus more on the humans who interact with the computers." "Unlike jetliners built in previous decades -- which required pilots to frequently manipulate controls and often manually fly the planes for long stretches -- newer computer-centric aircraft such as the A330 and Boeing's 777 are designed to operate almost entirely on automated systems. 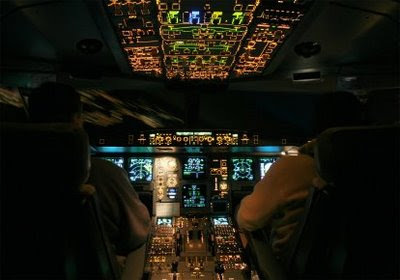 From choosing engine settings and routes to smoothing out the ride during turbulence and landing in low visibility, pilots essentially monitor instruments and seldom interfere with computerized commands. So when those electronic brains begin to act weirdly at 35,000 feet, the latest crop of aviators may be less comfortable stepping in and grabbing control of the airplane. "Airlines typically use simulators to train cockpit crews for such events, but a pilot may only hone skills to deal with major computer problems every few years. Pilots hardly ever experience multiple computer failures in real-world conditions." "The issue is particularly keen now as the aviation industry's true stick-and-rudder men--fliers, like US Airways' Sully Sullenberger, who cut their teeth in the pre-digital era and who can sometimes still bring a wounded plane down safely through a combination of testicular fortitude and instinct--are hitting retirement age in increasing numbers. "Many of today's younger jet jockeys haven never flown a plane without help from a computer. "It's one thing if Gmail goes down for a couple of hours. It's something wholly different if the software and chips designed to keep a 200 ton tin can straight-and-level as it hurtles along at 500 MPH can't be trusted." "[W]e must consider new ways to build a great network for knowledge -- not just a broadcast system, but one that employs every means of sending and of storing information that the individual can rise. Think of the lives that this would change.... A wild and visionary idea? Not at all. Yesterday's strangest dreams are today's headlines and change is getting swifter every moment." -- President Lydon B. Johnson, signing the Public Broadcasting Act on Nov. 7, 1967. This "Futurist" is a little behind the times in reporting some news about my own future: Next month I am leaving GOVERNING and CQ Inc. to join what I already consider to be the "great network for knowledge" that LBJ promised this country would build 42 years ago. As NPR's new managing editor for digital news, I will help lead the online efforts of what Fast Company has rightly called "the country's brainiest, brawniest news-gathering giant" and the "most successful hybrid of old and new media." "Part of our desire to bring more NPR to more people is that, with the evisceration of commercial journalism, there's a dire need for it. Major mainstream stories are increasingly going uncovered. And I think it might be the nonprofit journalism world that meets that huge market need, which is also a basic need of a democratic society and an information-based economy." NPR also is a great organization, filled with friends, former co-workers and colleagues and many of the best journalists in the business. Chief Executive Vivian Schiller spoke at the National Press Club a few months ago about the "disruptive challenges" affecting all media. She also explained NPR's need to preserve its standards and personality ("the quality we call internally our NPR-ness") while continuing to "branch out into other platforms" -- making sure public radio is serving its best work to a growing audience "however they choose to consume it, not the way we want them to consume it." Among the related priorities the former New York Times executive outlined: increasing collaboration across the public media system, including radio, TV, local stations and new online start-ups; stepping up the system's investigative output, nationally and locally; and engaging and interacting with the audience. Vivian also alluded to President Johnson's prescient 1967 statement about the need to build a multi-platform "network for knowledge." "It's almost like they were anticipating the Internet," she said. Four decades later, the most pressing question I see for all of us in media is how to navigate the challenges and swift changes of the moment while also anticipating and preparing for the "strangest dreams" of the decades ahead. The future -- hmmm... What a great assignment. Adapted from "Calling All Cars," my "Futurist" column in the June 22 issue of CQ Weekly. 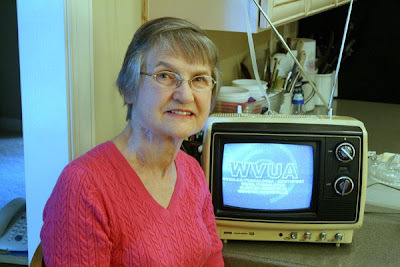 My mother-in-law's kitchen television (shown here with its owner) is as indestructible as a cockroach. Having assumed that the nationwide move to digital TV would mark the end of the ancient black-and-white's long life, my wife's mom was delighted to turn on the set after the June 12 switchover date and find that one analog channel was still on the air. A Tuscaloosa station, owned and operated by the University of Alabama, was among the low-power local broadcasters that Congress exempted from the conversion, so the dependable little relic would avoid the landfill for a little longer. By the time most analog transmissions went off the air the week before last, most people who owned TVs as old as my mother-in-law's had either purchased new digital converter boxes for their sets or signed up for cable, fiber or satellite service, which were unaffected by the digital transition. Sets of more recent vintage typically came equipped to turn digital signals into high-resolution images of dancing celebrities and all the gory evidence that makes "CSI Wherever" so popular. As it happens, the needs of real-world police investigators were among the selling points for this switch. Yes, moving to digital "will free up parts of the valuable broadcast spectrum for public safety communications (such as police, fire departments, and rescue squads)" -- as a frequently-asked-questions page on DTV.gov, the federal government's homepage for the transition, prominently (and some might even say deceptively) notes. But many of those "important benefits" of the recent switch are at least several years away -- held up in part by a failed effort to find a private-sector partner to develop this valuable new communications system. Most of the airwaves the digital transition freed up were actually auctioned for commercial use last year, generating nearly $20 billion for the Treasury. The Federal Communications Commission separately put up for bid a sliver of the broadcast spectrum in the 700 megahertz band for public safety uses. The plan was to create a public-private partnership to combine this 10 megahertz -- from a segment of the spectrum called the D Block -- with a nearby 10 megahertz that was previously put aside to help create a super-fast, interoperable national network for emergency communications. While ideas for using faster networks are plentiful, safety officials know better than most that high-speed chases are unpredictable. In this case, their plans for a national network took an unexpected turn early last year, when questions about price, penalties and unclear requirements appeared to scare off any qualifying bids for the D Block. While the FCC has been rethinking its plans for how to license the D Block, public safety groups representing police chiefs, fire chiefs and sheriffs, among others, have been discussing other ways to move forward. One proposal would let interested regional partnerships begin building their own broadband networks using the available frequencies. The District of Columbia has already done so as a pilot project. New Jersey, New York City, Boston and a San Francisco Bay area consortium are formally asking to follow suit, and New York state and the Seattle area are making plans to join them. Under this model, these states and communities would move forward using mutually accepted standards that would eventually allow them to connect with whatever national network emerges -- in effect, creating a network of networks. At the same time, those networks would provide testing grounds for government and business applications hoping to take advantage of all that connectivity. The Public Safety Spectrum Trust Corporation, a nonprofit organization formed two years ago to hold the license for the original 10 megahertz set aside for emergency communication, generally backs the idea. But there are obstacles. First, FCC waivers would be needed for any cities, regions or states that wanted to use the D Block frequencies or the nearby spectrum currently licensed to the nonprofit corporation. More significantly, the standards for a shared national network are still a work in progress. So, for instance, a community that decided now to build its network using an emerging wireless service called Long-Term Evolution, or LTE, might have to reboot and rebuild if a rival next-generation standard called WiMax ultimately won the day. Major players in the mobile industry have placed big bets on each and will fight to keep from being bumped out of the game early. These complications aside, Congress is likely to want more action and less static when it comes to getting broadband services up and running for the nation's emergency responders. On that technological issue, even my mother-in-law is getting the picture, especially now that she has given up all but one channel to help solve the problem.